First responders examine the scene of a fatal accident Saturday afternoon on Briary Road south of the AA Highway at Quincy. A Quincy woman died Saturday afternoon as the result of a single vehicle accident on Briary Road (Ky. Rt. 1021) south of the AA Highway. Deputy Gary Sparks said the accident happened about 4:40 p.m. Saturday as a 1986 Chevrolet Celebrity, operated by Janeen Campbell, 47, of Burnt House Hollow, was traveling north on the roadway. 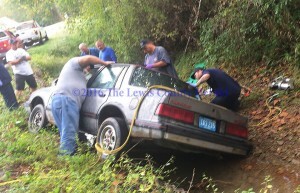 Sparks said the vehicle went off the left side of the roadway and into Briary Creek where it struck an embankment.